Before and After Tile Paint! Thank you for your suggestions and ideas! I love some of the more daring/colourful ideas, but I don't think I'm, personally, bold enough to go with such a contemporary look. I'm going to stick to a traditional/modern style and use large (4" x 8") white subway tiles and dark grey grout. I'm thinking of using a dark grey paint around the kitchen walls and then a lighter shade around the rest of the room, with maybe the dark grey on the wall behind the TV too. Will be a few more weeks before that's all done, but I'll post a picture when I eventually get there. Thanks again! Hi @mjdpower, My suggestion is to go to a couple of floor specialist and ask as they may come up with something different. Whatever you do keep in consideration the size of the room and think on a long term: a poor quality finish could effect your property price in a space as important as the kitchen. I will try something that allow you to go back to your original tiles floor if things do not work out the way you want them to go. 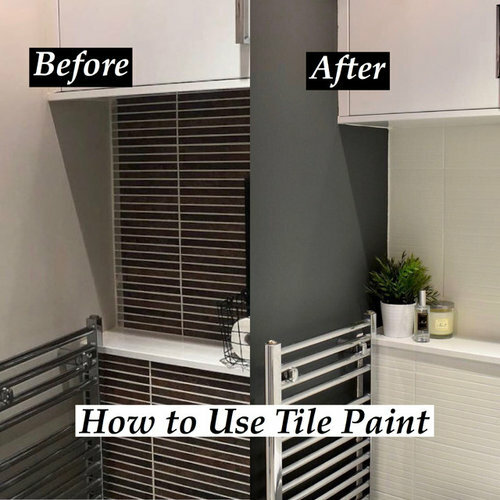 A cheap way is to cover the tiles with vinyl and here is how to do it: http://www.doityourself.com/stry/how-to-install-vinyl-flooring-over-ceramic-tiling#b the adhesive should not stain or damage the tiles (ask the manufacture before doing it anyway!) and you have a large choice of design and colours. Paint tiles could be another option, not my favourite but an option. I found this blog where Curry Kay describe step by step how she's did it. It's American USA but it will give you an idea to start with. https://currykay.wordpress.com/2011/03/01/powder-room-brand-new-floor-painting-tile-tutorial/comment-page-1/ Be aware that the kitchen is a high usage room so the paint will take a good bashing and may wear off. Plus the final look on a large surface like the kitchen area could be not as good as on a splash back or smaller vertical surface. I hope it helps! Have fun! If the grout was supposed to be white but has come out grey then there is either an issue with the grout or this is as I described before. I certainly wouldn't use a grout pen until you have looked at cleaning the residue from it. If this is polymer residue then the grout pen would only stick to this so would probably wear off and become patchy. If there is an issue with the grout then you should speak to the manufacturer, this does happen on occasions and they will check it if they are a reputable company. Who was the grout manufacturer? Email Ceramica is the group of companies which Viva belongs to. So I suspect that this is the tile I mentioned. I know the tile as we sell it, the tile is very good quality. Speaking as a tiler with 18 years experience if the grout was grey and has come out white then it can only be the issues I have described. Cleaning should definitely be your first option.